A friend in Saint Gemma kindly passed along a wonderful high resolution image [to the left] of an icon of St Gemma with the stigmata which is on display at the Monastery-Sanctuary of Saint Gemma in Lucca, Italy. You can click on the image to enlarge it. 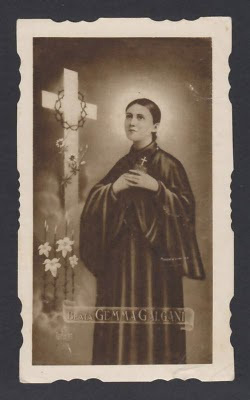 St Gemma was given the stigmata for the first time on June 8, 1899, the vigil of the solemnity of the Sacred Heart of Jesus, and the stigmata remained throughout the evening until 3pm Friday afternoon, the feast of the Sacred Heart of Jesus. The stigmata would recur on Thursday night into Friday afternoon thereafter. Many persons of learning and piety were given opportunity to witness them. Among others there came to Lucca in August of the same year, 1899, the Provincial of the Passionists, Father Pietro-Paolo Moreschini, a holy and cultured man who became in later years Archbishop of Camerino. 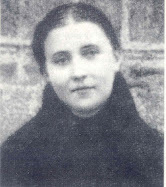 It was but natural that Signora Cecilia Giannini, who had begun to take interest in Gemma, should speak to him of Gemma's extraordinary mystical experiences. The learned Father listened in silence and expressed the desire to see the girl. The meeting was arranged to take place in the afternoon of that very day. During it the Reverend Father showed no sign of special esteem or admiration for Gemma. "If I must concern myself with your admission into the Convent, I should first be certain of your vocation. 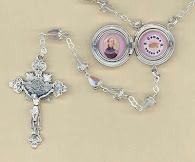 Pray Jesus to grant me to see the two signs I myself have asked for at this very moment." These were the sweat of blood and the stigmata. At about half past two in the afternoon of that day, Gemma, according to custom, went to pray before a large crucifix that stood against the wall of the Giannini's dining room. Often she had fallen into ecstasy while looking at that: image of the Saviour and often, too, she had been miraculously raised from the ground and been allowed to kiss the Sacred Wounds of Him who died for mankind. Once in September, 1901, while busy with some housework her eyes turned, now and again, to the great crucifix, as if drawn thereto by an inner irresistible force. It called her. "Jesus," she said, at last, unable to bear any longer the flame of love burning within her soul, "let me come to You, for I die of Your love." Suddenly the figure of Christ began to stir with life and stretched forth one arm inviting her to go to Him. Borne on the wings of love she rose to His embrace. For a little while there she stood, as one resting on clouds, to drink with her lips from the fountain of love divine. In memory of this event the light of a ruby lamp now glows, day and night, before that image of the crucifix on the wall of the dining room of Giannini house. This crucifix is held in great veneration by the faithful. "Father, perhaps the other sign you prayed for is the stigmata?" "Why do you ask me?" he exclaimed with great surprise. "Because," she answered, "I have seen two red marks appear in the hands of Gemma. They are like those she has every Thursday." "The head of the girl was flexible but without movement. Her face was corpselike, the hands seemed contracted and I saw in the middle of each palm as well as on the corresponding back of the hand, a wound of oval shape and about a centimeter in size. Round the head I saw drops of blood especially over the brows. The phenomenon lasted ten minutes after which the skin resumed its natural color except for a few drops of blood staining the hands." "I saw with my own eyes the wounds in her hands, both in the palms and on the back of the hands. They were really rent open. After the ecstasy they healed up and only a slight scar remained. How could such wounds thus heal immediately by mere natural means? I do not hesitate to say that it is the work of God, and the more so, because this girl is extremely humble, obedient, innocent and has a great love of suffering. I am still of opinion that you should provisionally place her in a convent, for the many reasons of which you are aware." Notwithstanding this judgment of the Provincial Father, Monsignor Volpi, Gemma’s confessor since childhood, who was indeed very prudent, was still very reluctant to recognize God's finger in these events without even clearer proof. He would not be lightly budged from the path of prudence. In particular he desired that these manifestations, whether divine or diabolical, should cease, and he ordered Gemma to keep clear of them. And for her part, Gemma strove her best to obey, although the effort was not always successful, as the "spirit blows where He wills". "These things," she wrote, "seem as impossible to me as they do to you but, please, do not blame me for this. I do not want them ... I say to Jesus: 'See, my Jesus, if You had dealt less generously with me, and had loved me less, I might not have loved You so much .... As it is I cannot exist without You: if it be truly You, then make it known to everybody. But if it is the work of the evil one, then I wish to have nothing to do with it.' "
Again she wrote “The happenings of Thursday and Friday continued to take place, and Monsignor thought it well to have me visited by a doctor unknown to me, but I had warning previously from Jesus Himself, Who said to me: "Tell the Confessor that in the presence of the doctor I will do nothing at all that he wishes." Concerning these “happenings of Thursday and Friday”(as Gemma discreetly called them) Monsignor Volpi, in his prudence, sought the aid of a medical doctor to help discern. He arranged, without telling Gemma, to have one come to examine her. Gemma was warned of this in a dream and was told [in the message above] to make known to Monsignor that his plan did not please God. Despite her admonition, the doctor was brought and he pronounced her a victim of hysteria, for when he applied water to the wounds they entirely disappeared. God did not intend that human science should have any hand in the mystical experiences of the girl. He could count on Gemma bearing the humiliation, since it was His will. Reading the letters bearing on this visit, one is moved to admiration of the self-abnegation of Gemma and stirred at seeing the heights to which God challenges a soul that has surrendered to His keeping. If you had only been alone at the time of your last visit, Jesus would have manifested the truth to you. Today, when I began to make the Three Hours Agony, I felt something had happened to me. Yesterday evening Jesus had told me that today you ought to come. I did not wish to begin the hour, because I was confused. At last I submitted. 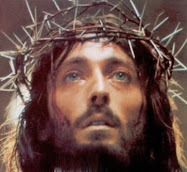 At first I suffered in the head and in the heart, but after a little while Jesus spoke to me thus. "Do you not remember, My daughter, that I told you that there would come a day when no one would believe in you anymore? Well, this is that day. Oh how much more acceptable you are to me thus despised than before when all believed you to be a saint." Jesus then told me that with you there would be another person, who would be a doctor, but that He did not wish him to see anything. Jesus told me today that I should accept that humiliation, and I have done so willingly. It may be, as the doctor has said, that it is hysteria. Even should it be so, Jesus loves me. I ask your blessing, and pray Jesus that for every kind of suffering that He sends me, He will give me the strength to endure all. And so, Monsignor Volpi, who seems to have personified in himself the skeptical spirit of our age, made up his mind to clear his doubts by a definite recourse to men of science. He told Signora Cecilia, who faithfully used to report to him the events of each week, that he would call on a Friday to have the stigmata examined by a doctor. The arrangement was kept secret from all. But, as we just read, He who penetrates into the inmost recesses of our thoughts, revealed the secret to Gemma and commanded her to signify to the confessor that, whatever sign he asked would be given, provided he came alone. In the presence of the doctor nothing would happen. It all happened just as Gemma had foreseen. On September 8, Feast of Our Lady's Nativity, which that year occurred on a Friday, she went into an ecstasy shortly after one o'clock. Blood was flowing from her head as well as from the open wounds on the hands. Cavaliere Giannini together with his wife and Signora Cecilia were there looking with respect and eyes full of wonder. Quite unexpectedly, at about two o'clock, Monsignor Volpi and a doctor entered the room. The latter, after a few minutes' observation, dipped a towel in water and washed the head and the hands of the ecstatic. Straightway the blood stopped and no trace of wounds could any longer be seen. "There," exclaimed the doctor, "it is all the effect of hysteria. When suffering from this disease, they do these things. They make the blood flow by means of pins and needles." "No," rejoined Monsignor Volpi with vehemence, "I cannot think this child capable of such deceitful tricks." For Monsignor Volpi, we must recall, had known Gemma since she was a little girl, and was her confessor since childhood. "One thought I was a somnambulist; [a person who does things in her sleep -editor] others that I was suffering from some illness; others that I myself had made the wounds in my hands and feet." Our Lord assured her that these trials had been permitted by Him and would be followed by trials even more painful, but He added: "I shall give you a new spiritual Director by whose aid Monsignor Volpi will be won over to your side." Toward evening Signora Cecilia went out of the house for a stroll and for a breath of fresh air. She took Gemma as a companion. They had not gone far when the latter timidly said: "Will you, please, take me to Jesus in the Blessed Sacrament. I need Him." They entered a church nearby and prayed for nearly an hour during which Signora Cecilia never withdrew her eyes from her ecstatic companion. "I would say something to you but I am so ashamed of myself," Gemma said on coming out of the church, and added: "Look at my hands." They were bleeding and there appeared on them two clear wounds. Monsignor Volpi, to whom Gemma was taken, saw the blood and attentively examined the wounds but expressed no opinion. Outwardly he was still incredulous, but in his heart he could no longer deny that appearances were all against him. Yesterday evening Jesus told me that I ought to tell you these things: "Tell your Confessor that whatever sign he wishes of Me I will give him; provided that he is alone. I will then convince him that it is not a usual illness. It is not your doing. Tell him that I will send you many crosses! And that instead of receiving love, I will receive dislike and contempt, and in addition, I will be abandoned, even by Jesus Himself." Therefore, when Jesus allows me to suffer thus, I must not dwell on the pain, but I should prepare myself for other crosses in order to sustain them bravely, for Jesus once said to me: "Do you know, daughter, for what reason I send crosses to souls dear to me? I desire to possess their souls, entirely, and for this I surround them with crosses, and I enclose them in tribulation, that they may not escape from my hands; and for this I scatter thorns, that souls may fasten their affections upon no one, but find all content in Me alone. My daughter, if you do not feel the cross it cannot be called a cross. Be sure that under the cross you will not be lost. The demon has no strength against those souls who for My love groan under the cross. Oh My daughter, how many would have abandoned Me if they had not been crucified. The cross is a gift too precious, and from it come many virtues." I prayed then to Jesus that He would not concede to me any grace except that of loving Him very much, and Jesus said: "Oh soul dear to me, if you truly love Me, behold My chalice; you can drink it to the last drop. On this chalice I have placed My lips, and I want you to drink it." I told Jesus to do with me as He would. And then He said to me: "I have sent this cross to you, you do not appreciate it; rather it is contrary to your desire, but the more it is contrary, the more it is like Mine. 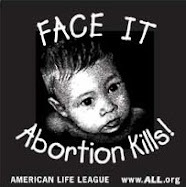 Would it not seem to you a dreadful thing to see a father in the midst of sorrow and the children enjoying themselves? When I shall be your Spouse of blood, I will come to you, but crucified; show your love to me as I have shown it toward you, and do you know how? By suffering, pains, and crosses without number. You ought, therefore, to consider yourself honored, if I lead you on paths hard and painful; if I permit that you be tormented by the demon, that the world despise you, that persons most dear to you afflict you, and with daily martyrdom, I permit your soul to be purified and tested. And you, daughter, think only of practicing great virtue; run in the path of the Divine Will, humbled, assured, that if I hold you to the cross, I love you." Believe nothing, because perhaps this is all imagination. Pardon me if again today I importune you. It seems to me that Cecelia Giannini is very much displeased with me since the visit of the doctor with Monsignor Volpi. Jesus Himself seems to have told me of her disappointment and she has felt the strange outcome of the visit very much; but He assures me that it has not been I who have given her cause for this unpleasantness. Jesus has allowed it thus. If you think it advisable, set her mind at rest. It seems that she has changed a little toward me; speak to her about it or do as you think best. If you could only see how many other persons also have changed toward me in these days on account of what happened. I imagine I can see the thoughts that pass through the minds of others. Because of all these things there were some days when I did not pray any more for sinners. Jesus reproved me and told me that I should give thought only to poor sinners and not to these other things which He will take care of Himself. I am to think of nothing. He told me again that I am to be put into a convent at once. These things, as I have always said, may all be in my imagination and therefore, do not believe them. Do as Jesus wishes, because I am sure that Jesus will tell you what to do. "Daughter, do you know him?" I said no, as was true. "See," He added, "this priest will be your director, and he will be the one who will recognize in you the infinite works of My mercy." This white-haired Passionist priest was Venerable Stanislas Germano Ruoppolo, C.P. [Germano Ruoppolo has been officially declared “venerable” by the Catholic Church-editor) And those who know the story of Gemma know the important a role he was to have in the extraordinary life of Gemma. But to continue with the story of Gemma’s stigmata, in the letter below we see that like us the Saints are also very human, and at times while Gemma’s spirit within her accepted all, the flesh at times rebelled. Sometimes, when I ought to begin to pray, especially on Friday, I seem not to have the inclination, and Jesus says to me: "Embrace the cross, my daughter; be sure that, while you are satiated with suffering, you are satisfying my Heart, and remember, the more bitter the cross is to you, the more it conforms to mine. I, you see, have compassion on your weakness. I send you drop by drop the chalice of my Passion and I give you a little part of My suffering at a time." Do I do badly not to have the inclination when Jesus calls me? Even now, on Thursday evening, I feel that I do not wish to suffer this evening, but do you know my Angel Guardian tells me to be patient, because Jesus proportions the suffering as He wishes, and so orders the circumstances and disposes my heart to receive it. And then it is not at all the suffering which ought to conform to us, but we ought to conform to the suffering. I ask your blessing, and pray so much to Jesus for poor me, who has so much need. When will Jesus come? Tell Him you, too, Mother, want me. I want to go with you ... I have asked Him for so long! I wish Jesus would bring me very quickly to Heaven. My Mother, I desire to possess you always and I do not wish to be separated from you any longer. Oh! bring me to Paradise. I can live no longer without you. Do you see the suffering that you are causing me? I need your heart. Yes, each day I seek you in order to pour into this heart the sorrowful transports of mine. Do not leave me...Oh my Mother, Oh my Mother! If you are truly touched with compassion.--Oh! Why do you part from a child who loves you so tenderly? If you are not here, then who will listen to my prayers?....Who will grant my wishes? Without you I am as a beggar-girl stripped of all help. Mother, why do I give up? Thank you for posting this edifying article. It is very timely. My family and I need Gemma's help more than ever now. Less than two months after landing a new job, I find myself unemployed again. In addition, our friend's cancer has apparently returned, a few months after he was cured as if by a miracle. "If you do not feel the cross, it is not a cross." We're feeling the cross right now, although we recognize that there are many, many people in this world whose cross is far, far heavier than ours. 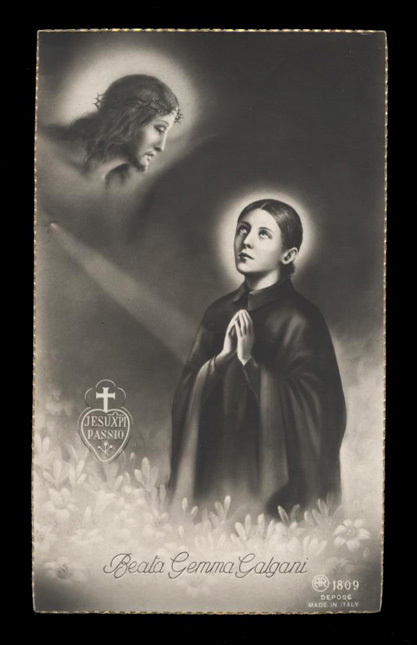 Please pray for us and plead for the intervention of St. Gemma on our behalf. I pray especially for your friend who is suffering from cancer--May God strenghten him and draw him ever closer to Himself. Also, I am praying that you may find a new job soon, and that St Gemma may be your special advocate during this difficult time for your family, and may she obtain from God the grace of a new job for you, and also all the spiritual graces that you ask for.